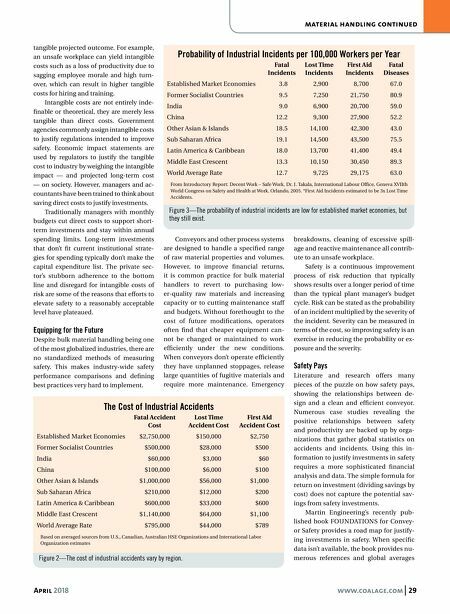 28 www.coalage.com April 2018 material handling The Economics of Workplace Safety Putting a price on material handling mishaps by r. todd swinderman It isn't a question of "if." It's a question of "when" a business will experience a seri- ous workplace accident or enterprise-wide disaster. There are many things that can be done to extend the "when," even to the point of making "when" an almost statisti- cal impossibility. 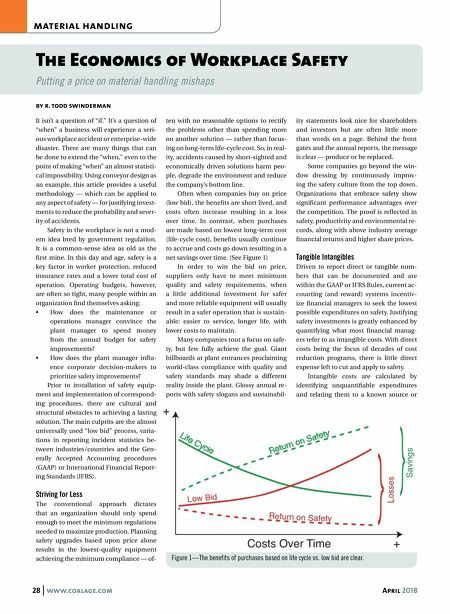 Using conveyor design as an example, this article provides a useful methodology — which can be applied to any aspect of safety — for justifying invest- ments to reduce the probability and sever- ity of accidents. Safety in the workplace is not a mod- ern idea bred by government regulation. It is a common-sense idea as old as the first mine. In this day and age, safety is a key factor in worker protection, reduced insurance rates and a lower total cost of operation. Operating budgets, however, are often so tight, many people within an organization find themselves asking: • How does the maintenance or operations manager convince the plant manager to spend money from the annual budget for safety improvements? • How does the plant manager influ- ence corporate decision-makers to prioritize safety improvements? Prior to installation of safety equip- ment and implementation of correspond- ing procedures, there are cultural and structural obstacles to achieving a lasting solution. The main culprits are the almost universally used "low bid" process, varia- tions in reporting incident statistics be- tween industries/countries and the Gen- erally Accepted Accounting procedures (GAAP) or International Financial Report- ing Standards (IFRS). Striving for Less The conventional approach dictates that an organization should only spend enough to meet the minimum regulations needed to maximize production. Planning safety upgrades based upon price alone results in the lowest-quality equipment achieving the minimum compliance — of- ten with no reasonable options to rectify the problems other than spending more on another solution — rather than focus- ing on long-term life-cycle cost. So, in real- ity, accidents caused by short-sighted and economically driven solutions harm peo- ple, degrade the environment and reduce the company's bottom line. Often when companies buy on price (low bid), the benefits are short lived, and costs often increase resulting in a loss over time. In contrast, when purchases are made based on lowest long-term cost (life-cycle cost), benefits usually continue to accrue and costs go down resulting in a net savings over time. (See Figure 1) In order to win the bid on price, suppliers only have to meet minimum quality and safety requirements, when a little additional investment for safer and more reliable equipment will usually result in a safer operation that is sustain- able: easier to service, longer life, with lower costs to maintain. Many companies tout a focus on safe- ty, but few fully achieve the goal. Giant billboards at plant entrances proclaiming world-class compliance with quality and safety standards may shade a different reality inside the plant. Glossy annual re- ports with safety slogans and sustainabil- ity statements look nice for shareholders and investors but are often little more than words on a page. Behind the front gates and the annual reports, the message is clear — produce or be replaced. Some companies go beyond the win- dow dressing by continuously improv- ing the safety culture from the top down. Organizations that embrace safety show significant performance advantages over the competition. The proof is reflected in safety, productivity and environmental re- cords, along with above industry average financial returns and higher share prices. Tangible Intangibles Driven to report direct or tangible num- bers that can be documented and are within the GAAP or IFRS Rules, current ac- counting (and reward) systems incentiv- ize financial managers to seek the lowest possible expenditures on safety. Justifying safety investments is greatly enhanced by quantifying what most financial manag- ers refer to as intangible costs. With direct costs being the focus of decades of cost reduction programs, there is little direct expense left to cut and apply to safety. Intangible costs are calculated by identifying unquantifiable expenditures and relating them to a known source or Figure 1—The benefits of purchases based on life cycle vs. low bid are clear.